Minto Rendezvous is an annual regional event where Sea Scouts test their knowledge and skills. The competition includes over 20 events that test a ship’s teamwork, training and preparation in a variety of nautical-related events. Some events such as navigation, first aid, knot tying relays and marlin spike require study and practice. Other events like blindfold canoe race and no paddle canoe race require luck and laughter to run the course. Ships from all across Texas and Oklahoma look forward to the fun and fellowship. The highlight of the weekend is the annual Flotsam Flotilla race of homemade vessels made from a variety of materials. The registration fee is $55 per person. The early registration fee is $45 per person until August 15, 2018. T-shirts can be ordered for $10. T-shirts must be ordered by August 26, 2018. At checkout, pay with a credit card, electronic check, or PayPal. Council refund policy. Onsite registration is $65. Pay online to get a discount. Check-in: Event check-in starts Friday night. Units will be assigned a campsite at that time and they will need to set up camp. Dinner will not be provided. A Skipper/Boatswain meeting will be held at 2000 and will be followed by cracker barrel at 2030 in the dining hall. Meals: Meals will be provided in the dining hall beginning with breakfast on Saturday and ending with breakfast on Sunday morning. Each ship will be required to provide assistance in serving meals and cleaning the dining hall after meals are completed. Billeting: Unit sleeping accommodations will be in tents provided by the unit. Each individual is responsible for their own sleeping equipment. A schedule will be provided at the first Skipper/Boatswain meeting assigning units for cleaning the shower/restroom facility that is nearest their campsite. Medical: Each ship will provide current BSA Annual Health and Medical Records (part A&B for all Scouting events) available at www.scouting.org/scoutsource/HealthandSafety/ahmr.aspx for each youth and adult that will be on-site during the event. Any injury shall be immediately reported to the medic for treatment. In case of a serious injury, the medic will notify the rendezvous chair and council representative. Bring whatever personal camping gear you will need for Saturday and Sunday night, including tent, sleeping bag, and ground pad as needed. Bring season and weather appropriate clothing for work outside, including rain gear, as we will be outdoors for a significant amount of the weekend. Bring water bottles or a hydration system. Sea Scout uniforms are required for the uniform inspection and awards ceremony. Bare feet, flip-flops, tank-tops, halters, tube-tops, etc. are not considered acceptable dress. Swim wear is acceptable when competing in water events only. Swimwear must be modest. No open-toed shoes are allowed. A Scout t-shirt or unit uniform is always proper. See the schedule for when the uniform is required. Wet socks or water shoes are required for all waterfront events including sailing (no bare feet). Every participant must bring a BSA Annual Health and Medical Records (part A&B for all Scouting events) available at www.scouting.org/scoutsource/HealthandSafety/ahmr.aspx. Adult Leadership: Each unit must have at least one adult leader for each 10 youth with 2 adults minimum. Units with female members present must provide appropriate female adult leadership. Arrangements with companion ships may be made to share gender responsibility so long as the ships are immediately adjacent in camping location and the responsible adult understands and conscientiously accepts the increased responsibility. All adults are expected to cooperate and participate when called upon by the rendezvous staff. Adult participation includes judging of events, campsite monitoring, kitchen staff, score sheet control, timekeeper, service watch, or other duties assigned by the event chair. Courtesy: Leaders should impress upon their members the necessity of exemplary conduct at all times. Inappropriate behavior will not be tolerated! 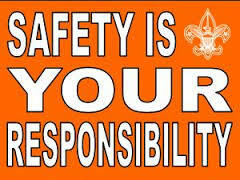 In accordance with BSA’s Guide to Safe Scouting, smoking is not permitted at scouting events and/or on Scout property. Adult Responsibility: Units are responsible for their camping areas and their bathroom facilities. Facilities will be inspected prior to checkout Sunday. Other adults will be responsible for the final cleanliness of the dining hall (including restrooms). Shore Leave: There is NONE. All youth are responsible for staying within the limits of Bovay Scout Ranch. Ship officers and adults are responsible for compliance with this rule. Swimming: Swimming is not permitted except as part of scheduled rendezvous events. Campfire: You may not build any sort of campfire or engage in Dutch oven cooking. Bathhouses: Facilities will be clearly marked for youth male, youth female, adult male and adult female. Liquor or Drugs: Possession or consumption of intoxicating products or drugs of any kind by participants, guests, or adults will not be tolerated at any time during the rendezvous. Violation of this regulation will result in immediate expulsion from the rendezvous. Special Needs: Anyone requiring refrigeration for medication shall notify the medic. If special accommodations are necessary for anyone attending the rendezvous, the unit shall notify the organizers a minimum of fourteen (14) days prior to the event. Special dietary needs or specific food allergies must be listed on the registration form and submitted on time. Please read the page on events, scoring and rules carefully. The scoring and participation may not be the same as other rendezvous. Teams participating in trial events will receive participation points. Awards will be presented to each participating ship. First, second, third and fourth places will be presented in addition to participation awards. Leadership and conduct will receive a special recognition. For additional information, contact Cassie Johnson at ch.johnson@sbcglobal.net.